Hill forest on karst limestone above riverside swamp forest, 50 m.
Moderately robust, clustering rattan climbing to 15 m. Stem with sheaths c. 11 mm diam., without sheaths to c. 9 mm diam. ; internodes c. 25 cm. 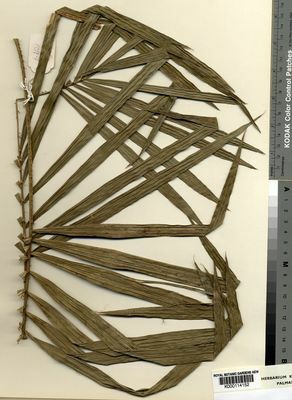 Leaf ecirrate to 74 cm long including petiole; sheath pale yellowish green, occasionally with patches of very thin, orange-brown indumentum, spines numerous, 1 – 2.5 × 1 – 1.5 mm, triangular, solitary, some deflexed, very few erect, colour as sheath, but with black tips, sometimes with dark purple-brown scales; knee 20 – 22.5 mm long, 9 – 10 mm wide, colour as sheath, armature as sheath; ocrea 24 – 28.5 × 1.6 cm, inflated, tubular, splitting longitudinally with age, clasping and usually obscuring sheath, papery, tattering to fibres, persistent at first, but eventually disintegrating completely, brown, with numerous needle-like spines 2 – 4 mm long and scattered dark purple-brown scales; flagellum present, c. 150 cm long; petiole c. 20 cm, 5.5 × 2 mm at base, slightly channelled adaxially, rounded abaxially, with scattered dark purple-brown scales, armed as sheath adaxially, with few solitary grapnels abaxially; rachis c. 39 cm, with indumentum as petiole, armed on abaxial surface with solitary and irregularly-grouped grapnel spines; leaflets c. 19 each side of rachis, arranged in three widely-spaced groups of 5 – 8 leaflets, leaflets regularly spaced within each group, but slightly divaricate, upper leaflets of middle group overlapping lower leaflets of upper group, linear, longest leaflet towards base 29.5 × 1.5 cm, mid-leaf leaflets 29 × 1.2 cm, apical leaflets 18 × 0.9 cm, apical leaflet pair not united, margins with bristles 0.5 – 1.5 mm, adaxial surface with bristles 1 – 3 mm on all major veins, abaxial surface with few bristles 1.2 – 2.5 mm on mid-rib only, leaflet with very few scales as petiole, transverse veinlets inconspicuous. Staminate inflorescence not seen. Staminate flowers not seen. Pistillate inflorescence very slender, flagelliform, 1.5 m long including 1.4 m peduncle, lacking flagelliform tip, branched to 2 orders; prophyll 28 × 0.5 cm, tubular, not splitting, with scattered dark purple-brown scales, with minute spines throughout; peduncular bracts 4, similar to prophyll, armed as prophyll, but also with scattered grapnel spines, rachis bracts 6 – 20 × 0.3 – 0.4 cm, tubular, tattering at mouth, with scattered indumentum of matted dark purple-brown scales, with numerous minute spines; primary branches 2, to 16.5 cm long, 4.5 cm apart, rather congested, with up to 13 rachillae, secondary bracts tattering, with armature and indumentum as rachis bracts; rachillae 8.5 – 20 mm × 4 mm, straight, erect; rachilla bracts 3 × 3 mm, distichous, funnel-shaped, tattering with age, with indumentum as rachis bracts; proximal floral bracteole 1.5 × 2.5 mm, distal floral bracteole 1.5 × 1.5 mm. Pistillate flowers 5.3 × 2.1 mm at anthesis; calyx 2.1 mm diam., tubular in basal 3 mm, with 3 lobes to 1.4 × 1.5 mm, with dark purple-brown scales; corolla 3.5 × 1.7 mm, tubular in basal 2.2 mm, with 3 lobes to 1.7 × 1.3 mm, glabrous; staminodes 6, 0.6 mm long, staminodal ring 1.4 mm high; ovary 2 × 1.5 mm, subglobose, style 0.7 mm long, stigmas 1 mm long. Fruit not seen. C. longipinnae Lauterb. et K.Schum. affinis sed foliolis paucioribus aggregatis vice regularibus, ocrea tubulari vice fissa, spinis ocreae acicularibus et ramis inflorescentiae pistillatae congestis vice laxis differt.